Text To Speech click is a mikroBUS™ add-on board that carries an Epson S1V30120 speech synthesis IC. The IC is powered by the Fonix DECtalk® v5 speech synthesis engine that can make your robot or portable device talk in US English, Castilian Spanish or Latin American Spanish, in one of nine pre-defined voices. 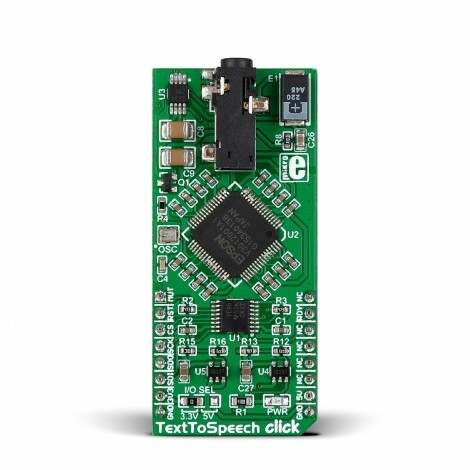 Text To Speech click is a mikroBUS™ add-on board that carries an Epson S1V30120 speech synthesis IC. The IC is powered by the Fonix DECtalk® v5 speech synthesis engine that can make your robot or portable device talk in US English, Castilian Spanish or Latin American Spanish, in one of nine pre-defined voices. The DECtalk engine includes a parser that gives users fine control over the quality, pitch and intonation of the synthesized speech. The audio is reproduced at 11.025kHz sampling rate. 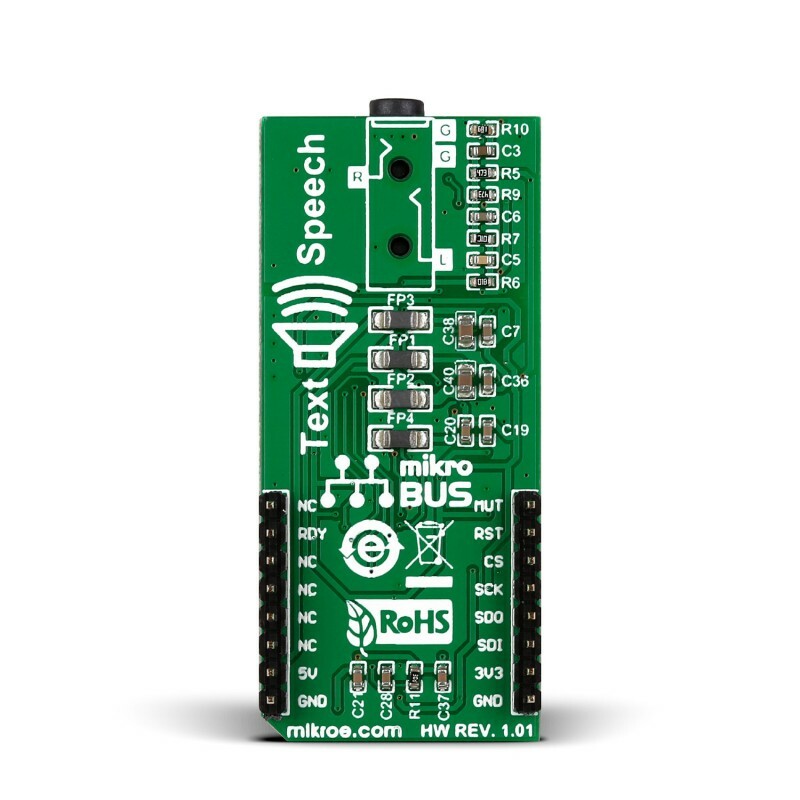 Text To Speech click board communicates with the target board microcontroller through the mikroBUS™ SPI interface (MISO, MOSI, SCK, CS) with additional functionality provided by DRDY, NRST and MUTE pins (in place of default mikroBUS™ INT, RST and AN pins) It can use either a 3.3V or 5V power supply. Applications Talking robots, text to speech and speech processing applications for embedded systems and portable devices. Key Features Fonix DECtalk® v5 fully parametric speech synthesis. Nine predefined voices. Key Benefits Languages: US English, Castilian Spanish, Latin American Spanish. Text To Speech click features a 3.5 mm audio jack for connecting an external active speaker. The Fonix DECtalk® speech synthesis engine that powers TextToSpeech click has been in development since the eighties. A large number of projects are available online. Few of them are listed in the Resources section at the bottom of this page. Browsing these projects will help you get a better idea on how the parser markup works to create a more natural sounding speech synthesis. 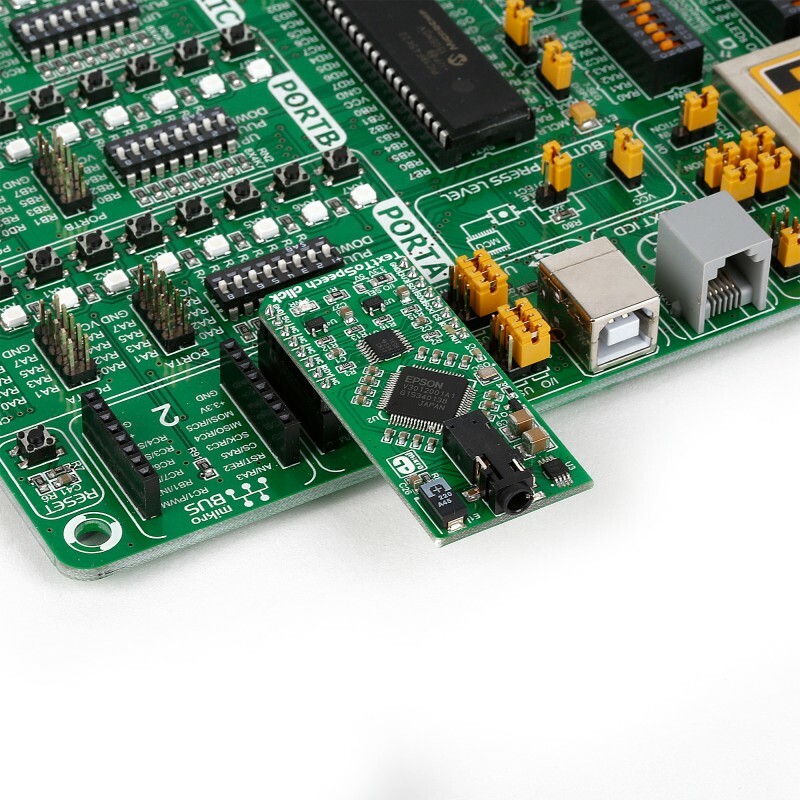 Note that Text To Speech click requires at least 6KB of RAM and 10KB of Flash memory from the target board microcontroller in order to function efficiently. 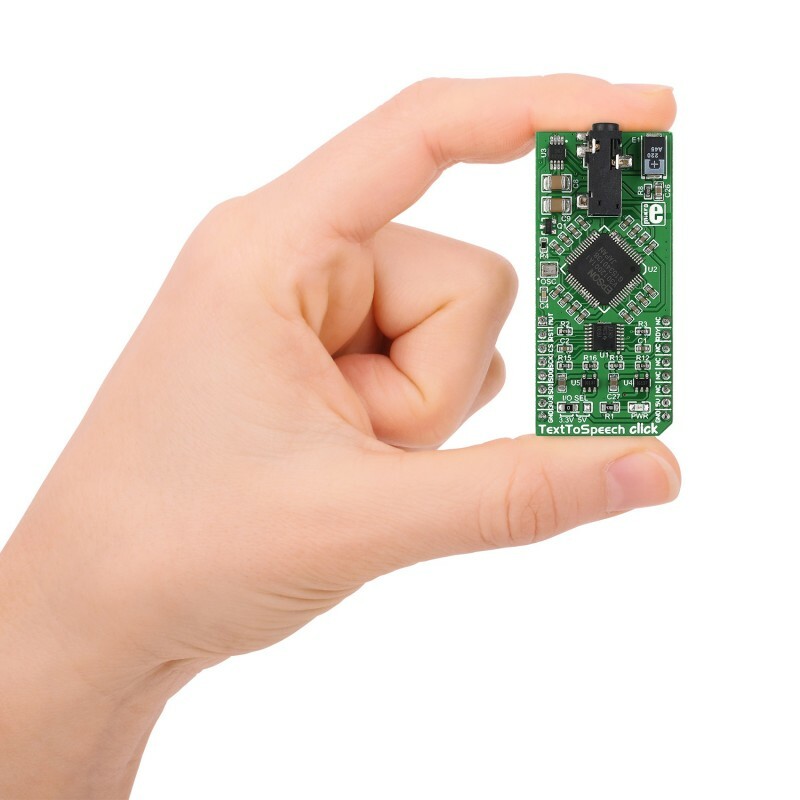 The S1V30120 chip also has Audio reproduction capabilities (ADPCM decoding). The audio reproduction bit rates available are 80kbps, 48kbps, 40kbps, 32kbps, 24kbps, with a sampling rate of 16,8 kHz. The following code snippet shows the DECtalk® speech synthesis engine parser in action. This code results in a natural-sounding, melodic rendition of "Happy Birthday to you"
Code examples that demonstrate the usage of Text To Speech click with MikroElektronika hardware, written for mikroC, mikroBasic and mikroPascal for ARM, PIC32, and FT90x are on Libstock.